Time for something a little different dear reader! As most of you know I usually only dabble in the worlds of science fiction and post apocalyptica when it comes to my hobby projects, however unbeknownst to most I also have a love of all things to do with the crusades. For a variety of reasons I have decided to engage in a brief tryst with this period by combining my passion for the past with my love of toy soldiers, and so I will be making up a small force of knights (and their company) from the first crusade. 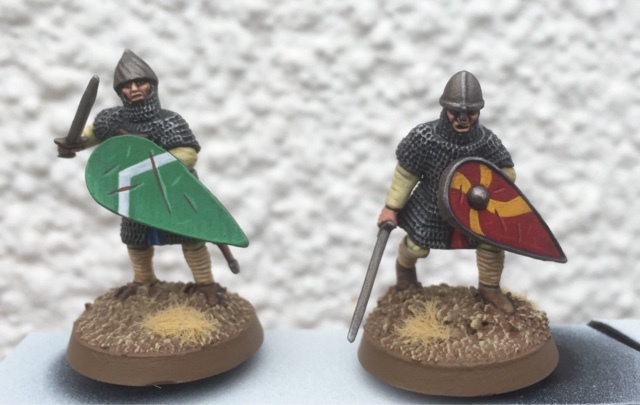 The joy of this period is that the equipment involved was similar to that used by the Norman invaders of 1066...which means that there are lots of models available for the hobbyist. After much searching of my local hobby store I settled on some rather fetching plastics of Norman Infantry from Conquest Games. These are great models and for £20 you get 44 troops... For someone used to paying GWs prices this was quite a refreshing experience!! I also bought a box of cavalry for a later project. Anyway with the bank holiday weekend available I decided to paint a few of these guys up, as I will be using them for skirmish/warband level games I decided to lavish a bit of extra attention on each of them. First off let me apologise for the lighting in the following photos... unfortunately I didn't realise how bright the light was at the time and how it would apparently drain the details from the models in the subsequent images. But heh-ho, such is life! 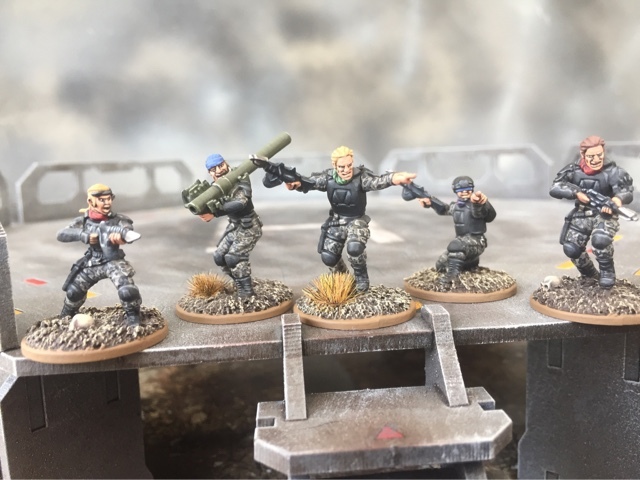 Anyway these latest completed miniatures are a set of the plastic resistance fighters from the Terminator Miniatures Game that my lovely girlfriend ordered me as a surprise last year (and that I have also reviewed in the latest issue of WSS Magazine). These guys will also double up as 'Talon Company Mercenaries' in my Fallout-Themed Games (I think the black armour ties them to this faction nicely, in fact they are almost perfect matches). 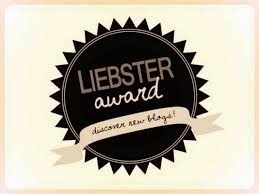 Well it seems that I have been remiss again, having disappeared for a while from the blogging scene! I must apologise for this dereliction of duty...work has been hectic and so my hobby time has been sadly curtailed of late. However on the plus side it seems that my second career as a Wargames Journalist has begun to take off, which is very encouraging. 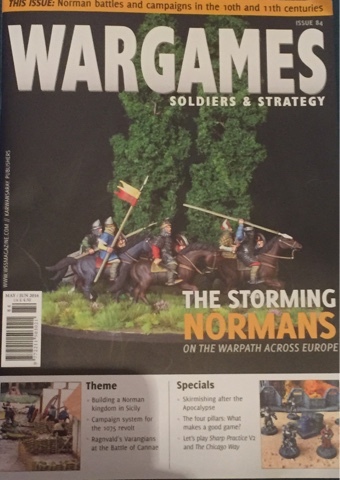 After having a couple of articles published in Issues 79 and 82 of Wargames, Soldiers and Strategy I am pleased to say that I now have a full four page spread in the latest issue of that veritable publication (Issue 84). 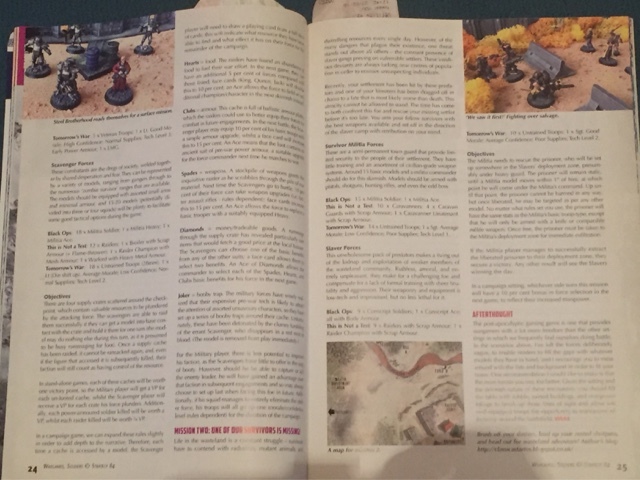 In fact this article is also accompanied by numerous photographs of my models in action - if you look closely at the bottom right of the front cover above you can see my Fallout: Brotherhood of Steel Knights (as featured in last year's BOYL15 Game: Fallout vs Rogue Trader). 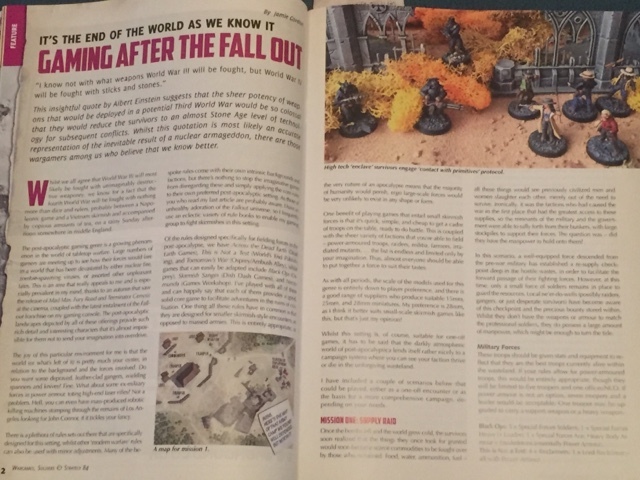 The actual article itself focuses on facilitating games set during the post-apocalypse utilising a variety of rule sets and available models. Throughout the piece there are some decent photographs of my models including my Enclave Troops, NCR Rangers and Necromunda gangers. The rules I've looked at in depth are, Tomorrow's War, This is Not a Test and Black Ops. I have also custom written two post-apocalyptic scenarios that can either be played as stand alone missions or as the basis of a larger campaign if it tickles your fancy. It is my sincere desire that this article will bring general PA gaming more into the main stream and hopefully draw in a few more adherents to this particularly cool niche of our hobby! Also later in the magazine I have written a one page review on Terminator: Genisys, The Miniatures Game, which will hopefully prove informative for those of you considering giving this particularly game a whirl.